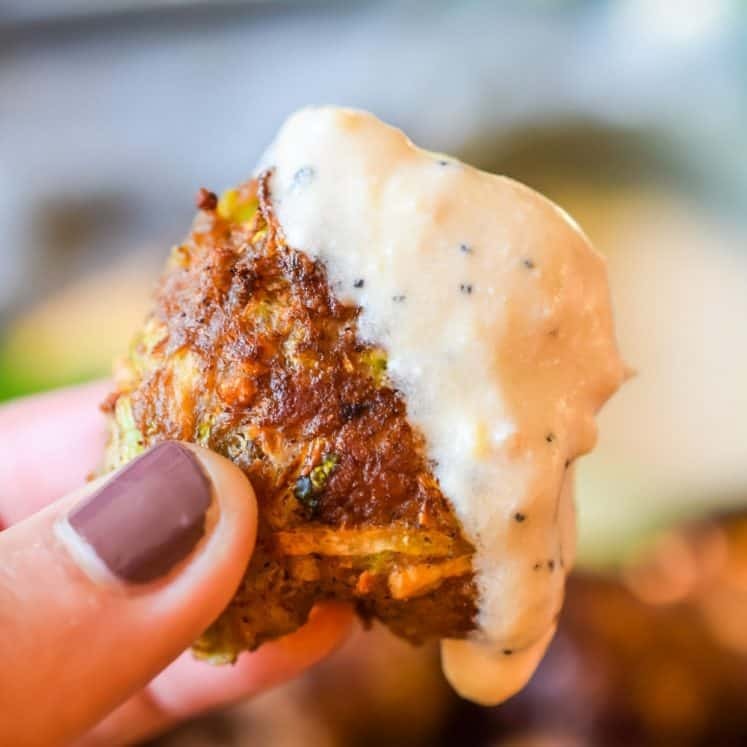 Delicious and easy keto egg roll poppers! Ground pork, broccoli and Asian seasonings in a delicious fried finger food! Heat your broccoli slaw in a large skillet with a tight-fitting lid with 2 tablespoons water for 10 minutes over medium heat. Let it cool then strain it through a fine-mesh sieve, kitchen towel or nut milk bag, you want to remove as much water as possible. Alternatively, you may microwave the slaw for 2 minutes on high heat before straining the water out. Heat a large skillet over medium heat with the coconut oil while you prepare the mix and the poppers. In a large bowl combine the pork, broccoli, garlic, ginger, salt, black pepper, mustard seed, coconut aminos, pork panko and eggs. Mix well until evenly combined. Shape 35 small balls and gently flatten. Check the oil, when a wooden spoon inserted sizzles, it’s ready to fry. Fry 6-7 poppers in the hot coconut oil, 3 minutes per side. Don’t overcrowd the skillet. I use a 9″ cast iron skillet for this. If your skillet is larger you will need add extra oil so it’s high enough to pan fry. It should come up to half way up the poppers when 6-7 are in the oil. Fry in batches until all the poppers are done. As you remove from the oil, place them on a paper towel lined plate. Make the sauce: combine all of the sauce ingredients in a bowl and stir well. You can use a MICROPLANE to get the garlic and ginger in a fine mince for this recipe, easier than using a knife!